When someone says “Bauhaus”, there is no doubt that the first three cities coming to the minds are Weimar, Dessau, and Berlin. They have been respectively the motherlands of the movement, and now are proudly getting ready to celebrate its centenary with endless events. My first article under this theme has been about Weimar; listing various exhibitions, talks, tours and many more under the roof of Bauhaus 100. My new article here is regarding the second step, Dessau, including many exciting events that will help us perceive what Bauhaus really is and how much it is involved in our daily lives. The permanent exhibition at Bauhaus Dessau represents works by the founders, teachers, and students of Bauhaus comprising around 40.000 objects and documents. The main idea behind the collection is to showcase original examples while reflecting on their living and working conditions. Even though the pieces in the exhibition are steady, due to the opening of the new Bauhaus museum it will extend its frame to a considerably broader concept. Carl Fieger has been one of the pioneers of Bauhaus architecture starting from his very first examples. He has had a tremendous effect on the professional community and future architects. He has been involved in many iconic modern buildings such as the Fagus Factory, the Bauhaus Building, and the Masters’ Houses. He was one of the teachers at the Bauhaus Dessau and a mere staff member in Gropius’s office. In 1953, he became the first architect to plan a prefabricated house in the GDR. The exhibition “Carl Fieger. 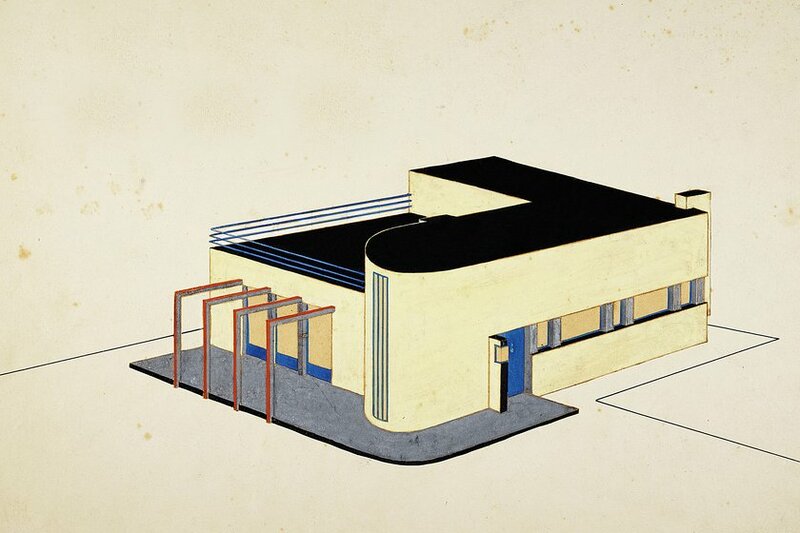 From Bauhaus to Bauakademie” will showcase his original drawings, architectural models, furniture, photographs, and works and they will be open for a visit to Bauhaus Museum Dessau starting from the 22nd of March. As a part of “Carl Fieger. From Bauhaus to Bauakademie”, visitors are invited to an interactive section in order to assemble or reconfigure a range of the architect’s housing typologies, based on the construction kit principle. New, fantastic buildings will be created from modular building components and transferred to a large, digital urban landscape. The use of the sensor and camera will enable visitors to immerse themselves in this landscape and change it. The curator of “Carl Fieger. From Bauhaus to Bauakademie”, Wolfgang Thöner, will lead a tour through the spaces in order to reflect the idea behind the exhibition. He will be giving information about the architectural models of Fieger including his best-known examples. Bauhaus Dessau has been chosen as one of the sites of UNESCO World Heritage. The 3rd of June marks the World Heritage Day 2018 which will prompt the Bauhaus Dessau Foundation to foster public understanding of the Bauhaus in Dessau. The ideational and material heritage will be explained to the visitors by way of the architecture and its usage. During that day, there will be free entrance to all Bauhaus buildings of the Bauhaus Dessau Foundation. Modern buildings are shaped by the norms and standards of the time in which they were built. These do not always comply with today’s ideas and standards and thus give rise to conflicting priorities, for which special solutions have to found. On the European Heritage Day, a talk and guided tour will be given by Monika Markgraf who is a research associate for building research and heritage conservation at the Bauhaus Dessau Foundation. As a part of the talk series Standardised Knowledge by Bauhaus Lab 2018, “Organised Transport. The Container System” is a talk by Alexander Klose who is an author and Container Researcher from Vienna, Austria. The international participants of the Bauhaus Lab 2018 investigate the elements and discourses bundled in the metallic connector: Social positions such as ‘housing for all’ are just as much part of the DNA of prefabrication as technological visions of architecture as a medium of universal connectivity. The exhibition put together at the Bauhaus from the findings of the research forms an open system that provides points of reference for the assembly of contemporary housing. The Lab is intended for young professionals worldwide from the fields of architecture, design, art and curatorial practice. The program will be held in the English language and will end with a joint exhibition at the Bauhaus Dessau. Participation is free and all participants will be provided with workspaces at the Bauhaus Dessau from May to August 2018. Up to eight participants will be selected by an international jury. As a part of the talk series Standardised Knowledge by Bauhaus Lab 2018, “Houses of the Production Line: The “Packaged House System” of Walter Gropius and Konrad Wachsmann” will be researching the universal wedge connectors. What makes the collection of the Bauhaus Dessau Foundation so special? What does it tell us and how should it be presented? Answers to these and other questions must be found by 2019, in time for the opening of the Bauhaus Museum Dessau, which will mark the centenary of the founding of the Bauhaus. The new museum will enable visitors to see a comprehensive display of the second-largest Bauhaus collection in the world. With the series “Open Doors!” the Foundation’s staff invite interested members of the public to follow the development process of the museum. As a part of the talk series Standardised Knowledge by Bauhaus Lab 2018, “Ernst Neuferts: Architects’ Data: A Standard Work” is a talk by the Berlin-based architect Gernot Weckherlin who have worked at Bauhaus-Universität Weimar and Universität der Künste Berlin. “Drawing Made Simple” is a part of the supporting programme for the exhibition “Carl Fieger. From Bauhaus to Bauakademie”. On European Heritage Day, visitors will have a number of opportunities to learn more about Carl Fieger using a range of drawing techniques to develop their own designs with the assistance of an illustrator. There will be no previous experience required. What is the idea behind the concept of the museum as a realm of experience? Will the historic experiments of the Bauhaus stage be performed as contemporary adaptations on the new ‘open Bauhaus stage’? What else can visitors expect to see on the ground floor of the museum? Under the theme of Open the Doors!, there will be a performance by Torsten Blume who is a research associate at Bauhaus Dessau Foundation. As a part of the talk series Standardised Knowledge by Bauhaus Lab 2018, “Weltformat DIN” is a talk by Markus Krajewski who is a professor of Media Science at the University of Basel, Switzerland. How will the new museum fit in with the culture of the Bauhaus in Dessau? Which connections and transitions will become apparent from 2019 between the museum with the collection on the one hand and the many historic original buildings on the other? What can visitors and the public expect? The event will offer an outlook with historic references by Dr. Claudia Perren who is the director of the Bauhaus Dessau Foundation. In the year of 1997, The Bauhaus Dessau Foundation started a tradition of annual parties called Bauhaus Festival. At the historic Bauhaus, standards were set but also demolished. Experiments were the order of the day in the workshops, on the stage, and in design. The Bauhaus Festivals especially were a place to break free from the norms through art – everything was possible! This is the starting point for the Bauhaus Festival 2018. The primary color yellow stands for expansion: for the dissolution of boundaries and against fixed forms. In this field of tension, modular playful structures will be built up and standards are broken down – through reinforcement, compression, expansion, and divergence. The result, a Gesamtkunstwerk of contemporary interpretations embracing artistry, theatre, music, installation, and performance, will take shape over two evenings. In 2019, three international festivals (School Fundamental, Architecture Radical, and Stage Total), each with a specific theme, present contemporary interpretations of the historic legacy. All the festivals have a scientific-artistic focus which, transferred to the various programme formats, invites visitors to discover the Bauhaus as a field of experimentation. The series begins with School Fundamental, a festival of learning. As a school of design, the Bauhaus was less about classical education and more about the all-round development of character. But is there any validity nowadays in the paradigm of “learning by doing”, of “overcoming the fragmented individual” (László Moholy-Nagy) by unleashing the individual’s creative powers? The Bauhaus Building in Dessau, as a curriculum made manifest in a building with workshops, preliminary course room, auditorium, and canteen, provides the ideal point of departure for the festival. The festival Architecture Radical chose Walter Gropius’s historic Employment Office because of the relatively unknown building models the Bauhauslers’ grasp of architecture as a manifestation of social change. The festival refers to this desire for renewal, to the (seemingly) uncompromising realization of powerful ideas. Not every experiment was successful, but they were daring, systematic, visionary and controversial. The festival takes the historic Bauhaus buildings as a starting point for explorations. The festival Stage Total takes off from the historic Bauhaus stage and launches the Bauhaus Museum Dessau as a venue. The color tone opera Violet by Wassily Kandinsky will be staged in collaboration with the Anhaltisches Theater, which is situated between the museum and the Bauhaus Building. The departure from traditional, literary theatre was written into every experiment on the Bauhaus stage. These were characterized by the desire for dramatic treatments of the pace and mechanization of modern cities and the intensity of experience provided by popular forms of entertainment like cinemas and theme parks. The Bauhaus and the city’s theatre – the connection between the two was close even in the 1920s. The Anhaltisches Theater Dessau complements the work of the Bauhaus Dessau Foundation with a very special programme titled Staging the Bauhaus, which is inspired by the annual theme. With his opera series Europeras, John Cage breaks through the norms of the European opera world of the 18th and 19th centuries.